A short set of photos of Cinema Hearts. These were taken at the National Cherry Blossom Festival which certainly explains all the pink. Normally I hate to post about the same band too quickly. It makes me feel like I haven't been getting out enough and finding other good bands. I photographed Cinema Hearts last year so I guess this will be an exception. I already reviewed their music too. Short version: It's garagey and it's great. 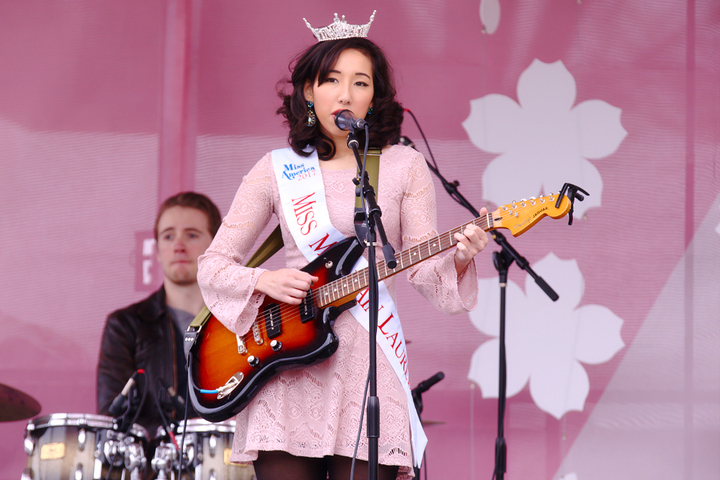 I decided to post about them again because lead singer Caroline Weinroth is also Miss Mountain Laurel, a local Miss America winner, and if you don't believe me check out the sash. In that role she has been raising money for Children’s Miracle Network Hospitals. I just want to encourage everyone to consider donating to them or to a similar non-profit which raises money for hospitals. All hospitals are facing financial uncertainty this week as our government prepares to vote on another health insurance overhaul. Now would be a really good time to help 'em out a little if you can. Just a thought.